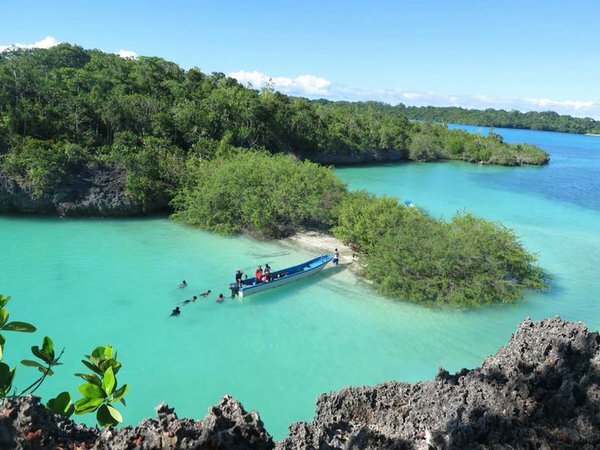 Tual city is located in Maluku and near to Southeast Maluku regency which is famous for the fine white sand beach, Pasir Panjang or Ngurbloat Beach. In addition to the popularity of Ngurbloat beach, Tual is also has Bair Island. Bair Island is a unique island with typical of tropical island. It is a small island with million charms. One of the uniqueness is coming from the two bays with crystal clear water and calm sea, mangrove vegetation and rock cliffs. At first glance, Bair Island is similar to Raja Ampat Papua but on a small scale. Bair Island is also a home for baby shark types Blackpit. To get to the Bair Island is quite easy. We can start the trip by land from the city center to Dullah Darat village with less than 30 minutes’ drive, by using 2 or 4 wheeled vehicles. We can also use public transportation to the village Dullah from the public transportation terminal in the ship port at Tual city. After arriving at Dullah Darat port / harbor we continue the sea trip by using speed boat, for Bair Island is located at the end of island series in the Dullah Laut Village. It takes approximately 1 hour drive. In Journey to the Bair Island we will pass several small islands, one of which is Adrenan Island. Adrenan Island is a small island covering an area of 500 m2 with the fascinating fine sand beach and the beach sand line that shifted to the east the because of the seasonal changes from east to west, and vice versa. Adrenan Island is suitable for those who like to play at the beach water and take some pictures. After passing several islands in Dullah Laut Village we will arrive at Bair Island and will be immediately treated by the rock cliffs that surrounding Bair Island and if we are lucky we will be able to see baby shark Blackpit. After arriving in Bair Island bay we will be served by the majestic of high cliffs and some rocky cliff in the middle of the bay. When the sea is receded we will find some beaches that can be visited because it is not covered by sea water. There are tips for friends who want to visit this island; bring sunblock, food and drink in moderation and do not forget to bring the litter back home to keep the beach clean. The best time to visit Bair Island is in the East spring or during the changing seasons from East to West or in vice verca. It precisely can be visited during March to August. Because the sea is calm and the waves are small.